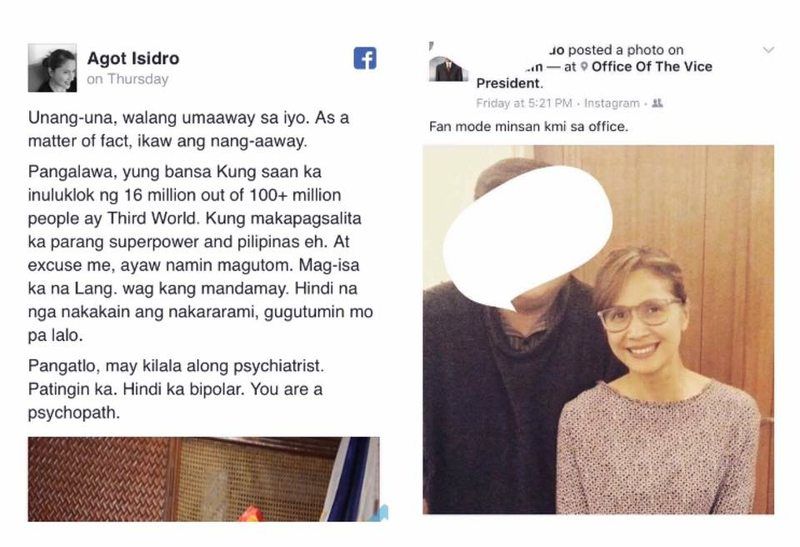 Agot Isidro made the headlines yesterday after she called President Duterte a psychopath. The Palace has since reacted saying it's 'her right' to speak against the government and its leaders. Dissecting every point she made, it has been found out that she is actually very wrong. Is Agot Isidro right in saying no one was triggering President Duterte's tirades against US, EU? She's wrong. These two entities, their representatives, leaders, have been lecturing us how we should run our country. You don't need a college degree to determine what's wrong with those statements. Philippines is a SOVEREIGN COUNTRY. No one can ever tell us how we should run this country except the Filipino people. If Agot can't understand that, then she should undergo psychiatric evaluation AGAIN. Netizens were also quick to discover where Isidro had been recently. In a Facebook post by Mike Lopez, he discovered that Agot and prominent Liberal Party members have met recently including Vice President Leni Robredo. Check this out. Agot Isidro posted a rant against President Duterte on Thursday. The following day she was in the Office of Vice President (?) Leni Robredo. The photo on the right was posted by the staff of Leni Robredo in OVP. He has since, just shortly after posting, taken it down. It's Agot's right to say whatever she wants to say so I won't comment on that, but isn't it curious why she'd be visiting the faux VP the day after her attack against the President? Your guess is as good as mine. This brings into question Leni's true loyalties. If you visit Twitter, you can see for yourselves how her daughter Aika's personal Twitter account has been liking largely anti-Duterte posts. Leni pretends to openly support Duterte yet behind the scenes her people and family members are working hard to paint him in a bad light. Leni is a backstabbing, two-faced fake. It's crystal clear as day. Traitors are the vilest people in all of creation. What do you make out of this? Be the judge.